P/O Clifford Frederick Page, RAFVR 60780 – Observer. Killed age 22 on the 7th of May 1941. Son of Frederick James Page and Hilda Page of Norwich; Husband of Muriel Alice Page, of Norwich. Buried Great Yarmouth (Caister) Cemetery, Norfolk, England.. Grave location – Sec. M. Grave 876. Ten Wellington aircraft of this Unit were detailed to carry out individual bombing attacks against the above target. One of these aircraft, R,3169, after having bombed the target area, and while on return journey, crashed into a barrage balloon cable at the mouth of the River Humber and dived into the water. The rear gunner, SGT. Craven, was the only survivor of the crew of six. The bomb load carried by the ten machines consisted of 1000 lbs., 500 lbs., and 250 lbs. Sgt. David Leo Nola, RNZAF NZ39930 – Pilot. Sgt. Alexander Coutts Mee, RNZAF NZ40656 – 2nd Pilot..
P/O Clifford Frederick Page, RAFVR 60780 – Navigator. Sgt. Walter Russell, RAFVR 949560 – Wireless Operator. Sgt. John Hall, RAFVR 988980 – Front Gunner. Sgt. Craven, RAFVR – Rear Gunner. Wellington Mk.Ic R.3169 AA-P and crew, took off from Feltwell, Norfolk to attack Hamburg. 115 aircraft took part including 50 Wellington’s (10 from 75(NZ) Squadron RAF), 31 Whitley’s, 27 Hampden’s, 4 Manchester’s and 3 Stirling’s. Due to poor visibility few aircraft failed to identify the targets. Only 12 bomb loads hit the target area and all aircraft returned. On return to England following the raid, the aircraft crossed the East Coast in cloudy conditions well north of planned track, as a result of a major variation in forecast winds. After a change of course south at 04:45hrs, the aircraft struck barrage-balloon cables near Trinity Sands, six miles East North East of Grimsby, Lincs. and crashed into the water out of control. Son of Arthur Edwin and Cecela Mary Page; husband of Margaret Page, of East Malvern, Victoria, Australia. F/O William George Simpson Pagett, RAFVR 151630 – Air Bomber. Killed age 27 on the 22nd of November 1943. Grave location – 26. A. 8. Four aircraft were detailed to attack the above targets with bombs of 1,000lbs and incendiaries of 30lb. and 4lb. One aircraft returned early owing to an Oxygen failure and two failed to return. The remaining aircraft successfully dropped its bombs in the Target Area. It was very difficult to assess the results as there was 10/10ths cloud over the target. Little opposition was encountered and no incidents were reported. Navigation was very good. The missing aircraft were Stirlings Mk.III LJ453 Captained by F/S A.Single and EF148 Captained by F/S. J. TURNER. F/S John Cecil Turner, RNZAF NZ421115 – Pilot. P/O Stanley Henry MacKenzie, RNZAF NZ422418 – Navigator. P/O William George Simpson Pagett, RAFVR 151630 – Air Bomber. F/S James Lindis Cowie, RNZAF NZ42322 – Wireless Operator. Sgt. George Joseph Blackman, RAFVR 1398967 – Flight Engineer. Sgt. Robert McLeod More, RAFVR 1809983 – Mid Upper Gunner. Sgt. Thomas McGloin, RAFVR 1796255 – Rear Gunner. Stirling Mk.III EF148 AA-R was brought down over Germany, crashing near Achner, 10miles North West of Osnabruck. There were no survivors. The seven crew members were buried at Achner but later reinterred at Reichswald Forest Cemetery, South West of Cleve. Sgt. Eric Henry James Painter, RAFVR 1359501 – Front Gunner. Lost without trace age 26 on the 30th of November 1941. Grave location – Panel 50. Eleven Wellington Ic and two Wellington II aircraft were detailed from the Unit to attack the above targets. A mixed bomb load was carried consisting of 4000lbs, 1000lbs, 500lbs, 250lbs and containers of incendiaries. Weather was clear and visibility good. A few bombs were dropped in the target area the remaining were bought back to base. Heavy, medium and light flak was encountered and a large number of searchlights were active. (Sentence illegible). One unidentified aircraft was also seen off the Frisian Islands. A convoy off Cromer fired at aircraft until colours were fired. Navigation was good. Astro and D.R. loop being used. One Wellington Ic aircraft, 1099, captained by Sgt. Harrison-Smith failed to return to base. F/S Francis Charles Harrison-Smith, RNZAF NZ403959 – Pilot. Sgt. Douglas Victor Sizmur, RAFVR 934205 – 2nd Pilot. Sgt. Daniel Mccready, RAFVR 1375023 – Observer. Sgt. Brian Dominic Meagher, RAFVR 1109620 – Wireless Operator. Sgt. Peter Buckby, RAFVR 1156870 – Rear Gunner. Wellington Z.1099 failed to return. It was shot down at 23:05hrs by a night fighter (Pilot; Ofw Paul Gildner, 4. /NJG1) and crashed into the Waddenzee. All members of the crew died. Son of Robert James Parish and Alice Parish, of Norwich; Husband of Olive Edith Parish, of Norwich. All the crew were killed. Lost without trace age 22 on the 17th of December 1942. Killed age 20 on the 12th of August 1944. Killed age 31 on the 7th of September 1942. Killed age 22 on the 11th of June 1944. Son of Richard and Elizabeth H. Parkin, of Burnopfield, Co. Durham. Killed age 21 on the 31st of August 1943. Son of Frederick Joseph and Wynna Ann Parkin, of Dargaville, Auckland, New Zealand. Grave location – 4. A. 9. Killed age 20 on the 13th of October 1942. 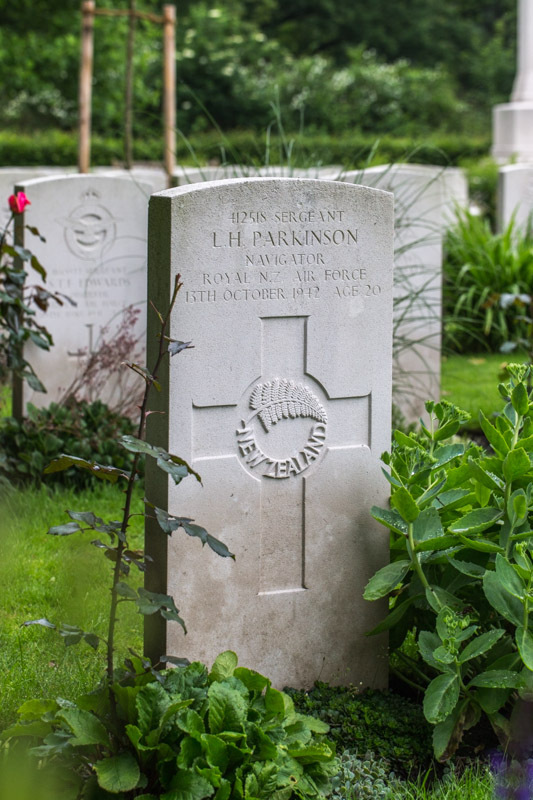 Son of Harry and Cecily Parkinson, of Opotiki, Auckland, New Zealand. Grave location – 3. F. 4. Killed age 21 on the 12th of March 1942. Son of Fred and Lucy Annie Parnham, of Cheshunt, Hertfordshire. Grave location – 2. H. 2. ‘For ever in our memory. Sgt. Algernon Parsons, RAFVR 1196149 – Wireless Operator. Killed age 22 on the 11th of October 1942. Son of Harry Fredrick and Mary Ann Parsons, of Cirencester, Gloucestershire. Grave location – AIII. 9. 15. Nine aircraft were detailed to carry out the above operation. 1500lb. vegetables were successfully planted in the allotted area. Wellington X.3597 captained by F/Sgt. Curr bombed a bridge near Middlefort with three 500lb. G.P. bombs, the first bomb was just short, others very close and might have hit the edge of the bridge. Light A.A. fire was encountered at Middlefort Bridge. No searchlights or enemy aircraft were seen. There was no cloud, visibility was good. Navigation was good by D.R. T.R., and visual pin point. Wellington BK341 captained by Sergt. Shalfoon failed to return. Sgt. Charles John Shalfoon, RNZAF NZ413897 – Pilot. Sgt Henry Wolfenden, RAFVR 1237318 – Observer. Sgt. Sydney Posner, RAFVR 1078313 – Front Gunner. Sgt. Roy Harold Scott, RCAF R.137578 – Rear Gunner. BK341 was brought down at 23.30hrs between the island of Langli and the Skallengen, near the entrance to Esbjerg Harbour on the Danish coast. All five crew of BK341 were killed, three of whom were buried at Fourfelt, near Esbjerg. Two others are commemorated on the Runnymede Memorial. Killed age 23 on the 14th of March 1945. Son of Ernest Edward James Parsons and of Ellen Elizabeth Parsons (Nee andrews), of Norwich. Grave location – 25. D. 4. At 16.35hrs on the run up to the target PB741, F/L Parsons & crew, was seen to have been hit by flak in the port-inner engine, which was then feathered. It also appeared to have been hit in the port-outer engine, which was feathered as the aircraft began descending quickly. Part of the wing caught fire and soon after, the complete wing broke off just as the Lancaster was diving through cloud. P/O William James Parton, RNZAF NZ41932 – 2nd Pilot. Lost without trace age 20 on the 12th of March 1942. Son of Robert Alfred Parton and of Margaret Parton (Nee Couper), of Merivale, Christchurch, Canterbury, New Zealand. Eight Wellington aircraft carried out an attack against the above target, one aircraft, captained by Sgt. Bell did not carry out an attack. Three aircraft captained by S/L. Kitchin, F/O. Sandys and Sgt. Parnham failed to return to base. Bomb load consisted of 1,000 lbs, 500 lbs and 250 lbs was dropped in the target area, bomb bursts being observed. There was heavy and light predicted flak and large cones of searchlights in the target area and one twin engined enemy aircraft made one unsuccessful attack on Wellington III X3586 captained by S/L. Newton. Weather was clear over the target with 5/10 cloud over North Sea. Navigation was by D.R. and TR1335. S/L Peter James Robert Kitchin, RAF 39539 – Pilot. Sgt. Herbert Sidney George Cullen, RAFVR 926722 – Observer. Sgt. William Clezy, RAFVR 1365054 – Wireless Operator. Sgt. Henry James Carter, RAFVR 929289/ 104474 – Front Gunner. Sgt. Lloyd Montgomery Chamberlain, RNZAF NZ40914 – Rear Gunner. The aircraft was recorded as lost without trace. All crew members are commemorated on the Runneymede Memorial. Son of Vivian and Elizabeth Pascoe, of Ashburton. Buried Ashburton (St.Andrew) Churchyard Extension, Devon, England.. Grave location – A. 3. Killed age 22 on the 25th of July 1944. Killed age 22 on the 23rd of May 1944. Son of James Thomas William and Elizabeth Alice Payne, of Limehills, Southland New Zealand. Killed age 22 on the 16th of April 1943. Son of Geoffrey Lockington Pearson and Anne Winifred Pearson, of Ventnor, Isle of Wight. Grave location – 20. A. 12. Lost without trace age 27 on the 17th of December 1942. 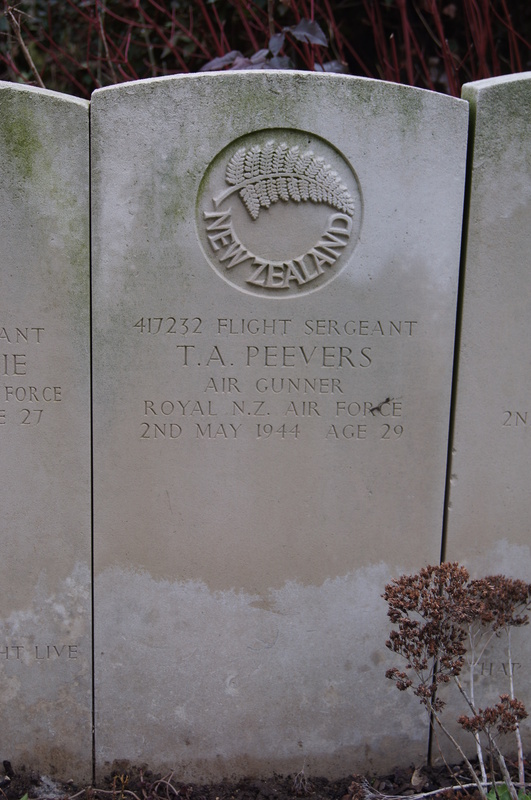 F/S Thomas Alexander Peevers, RNZAF NZ417232 – Mid Upper Gunner. Killed age 29 on the 2nd of May 1944. Grave location – Row A. Coll. grave 15-17. Sixteen aircraft were detailed to attack the marshalling yards at Chambly. Fifteen of these successfully attacked in clear weather, bombing being accurate. Two brief encounters with enemy aircraft took place and resulted in one being possibly damaged. One of our aircraft (Captain NZ41362 F/L. A/S/L. E.W. Sachtler) failed to return. F/L Euan Wilfred Sachtler, RNZAF NZ41362 – Pilot. F/O Allan Cleave Heron, RAFVR 133094 – Navigator. P/O Michael Ferdinand Lombard, RAFVR 171913 – Air Bomber. F/S Douglas John Mckenzie, RAAF AUS.417211 – Wireless Operator . Sgt. Piers Trevor Stevens, RAFVR 1813627 – Flight Engineer. Sgt. John Gilbert Pettifer, RAFVR 1247027 – Rear Gunner. ME689 was shot down over France, crashing at St Arnault, 12 miles South West of Poix-de-la- Somme. There were no survivors and all seven crew were buried in a collective grave. 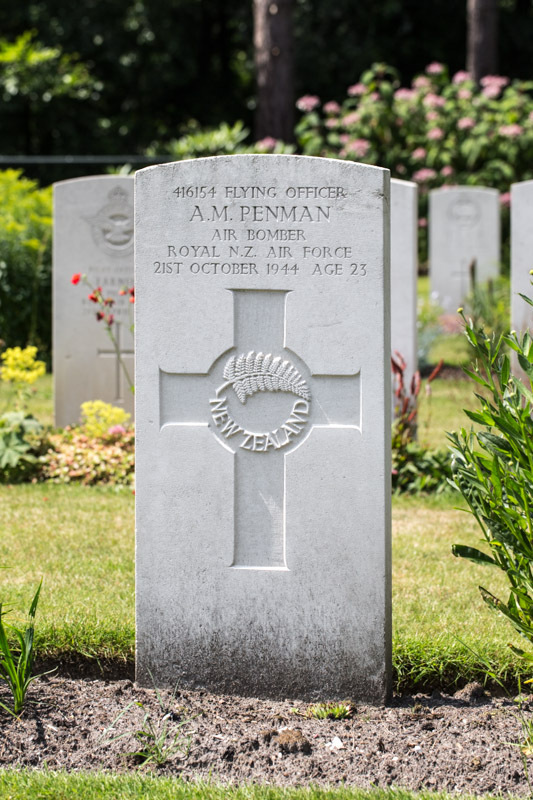 F/O Alexander Mitchell Penman, RNZAF NZ416154 – Air Bomber. Killed age 23 on the 21st of October 1944. Son of John Penman and of Martha Penman (Nee Davie), of Ashburton, Canterbury, New Zealand. Grave location – 13. B. 8. F/S Charles Pennycook, RCAF 137421 – Air Bomber. Killed age 20 on the 4th of October 1943. Grave location – Coll. grave 1. H. 1-7. Thirteen aircraft were detailed to attack the above targets with incendiary bombs of 30lb. and 4lbs. Three aircraft returned early and one failed to return. This was a good attack, ten aircraft successfully dropped their bombs in the target area. Very good concentrated fires and enormous explosions being seen, the fires were still visible on the homeward journey. A.A. Fire was negligible, there were many search lights which were cooperating with enemy night-fighters. The aircraft captained by S/Ldr. J.JOLL had a combat with a M.E. 109, which was claimed as possibly damaged. The weather was poor on the outward and return journeys, but clear over the target, visibility was good except for smoke haze. Navigation was very good. The missing aircraft was captained by SGT. H.J. MIDDLETON. Sgt. Harvey Johnson Middleton, RAFVR 1476465 – Pilot. Sgt. Charles John Massie, RAFVR 1322528 – Navigator. Sgt. Charles Pennycook, RCAF R.137421 – Air Bomber. Sgt. Leslie Pow, RAFVR 1024139 – Wireless Operator. Sgt. Eric Francis Hudson, RAFVR 1581611 – Flight Engineer. Sgt. Ernest Thorpe, 1514349 – Mid Upper Gunner. Sgt. Thomas Lackenby, RAFVR 1590747 – Rear Gunner. F/S James Pepper, RAFVR 1682572 – Rear Gunner. Killed age 23 on the 23rd of May 1944. Sgt. Walter Reginald Percival, RAF 553063 – Air Bomber. Son of Wallis George and Ellen Elizabeth Percival, of Blackheath, London. 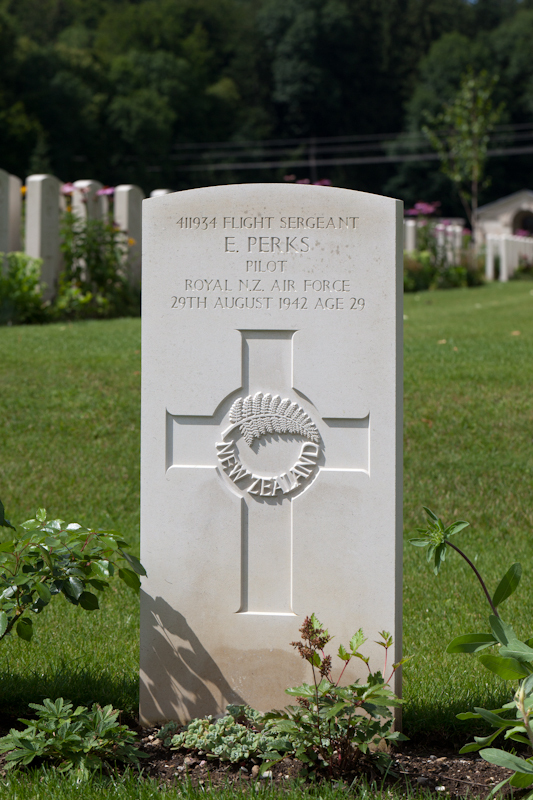 F/S Eric Perks, RNZAF NZ411934 – Pilot. Killed age 29 on the 29th of August 1942. Son of Leonard and Lilian Perks, of Onehunga, Auckland, New Zealand; Husband of Ruby Perks, of Devonport, Auckland. Grave location – 9. K. 18. 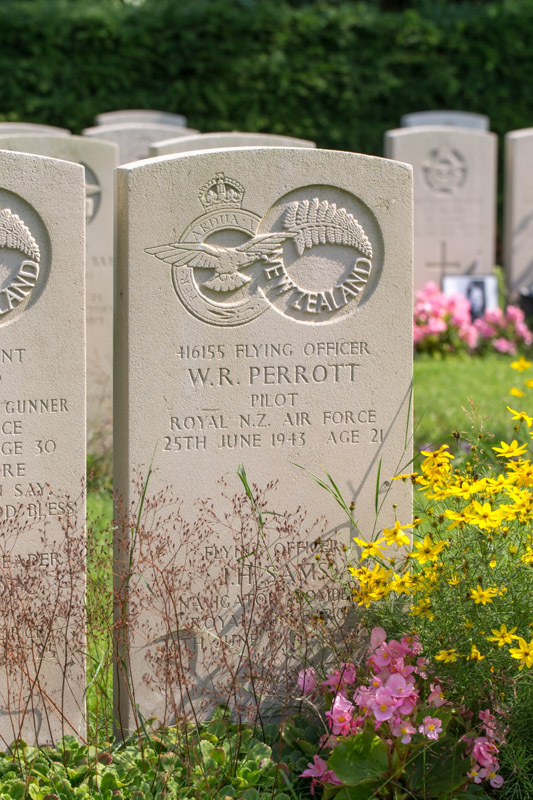 F/O William Rosser Perrott, RNZAF NZ416155 – Pilot. Killed age 21 on the 25th of June 1943. Son of William Rosser Perrott and Elizabeth Jane Perrott, of Auckland City, New Zealand. Grave location – Plot 69. Row B. Coll. grave 15. Eleven aircraft were detailed to attack the above targets, with incendiary bombs of 30lb. and 4lbs. One aircraft failed to return and the remainder successfully dropped their bombs in the target area. Owing to 10/10ths cloud it was difficult to estimate the effectiveness of the attack, although the glow of fires below the cloud, could be seen over a large area. Both moderate and heavy A.A.fire co-operating with searchlights was encountered, but were ineffective. Sergt. Burley’s aircraft sighted an unidentified aircraft from astern, the Stirling corkscrewed and the mid-upper-gunner and rear gunners opened fire. The unidentified aircraft was seen to dive to the ground and a fire and flash were seen. The aircraft was claimed to be destroyed. Some enemy aircraft were seen and three short combats took place but no damage was sustained by our aircraft. It was very cloudy in the target area and visibility was poor. Navigation was good. The missing aircraft was Stirling Mk.III BK768 captained by F/O Perrott. P/O William Rosser ‘Ross’ Perrott, RNZAF NZ416155 – Pilot. F/S Gordon Douglas Thompson, RNZAF NZ42317 – Navigator. F/S Clifford James Whitelaw, RNZAF NZ416188 – Air Bomber. Sgt. Charles Cyril Mould, RAFVR 1314162 – Wireless Operator. Sgt. William Webster Hilditch, RAFVR 611325 – Flight Engineer. Sgt. Gordon William Colyer, RAFVR 1809432 – Mid Upper Gunner. Sgt. Harry Squire , RAFVR 1302829 – Rear Gunner. Stirling Mk.III BK768 AA-L fell victim to the fearsome German night-fighter defensive system, operating as a radar-controlled ‘box’ along the Netherlands/ Belgium coast. Following a night-fighter attack, the Stirling crashed into the Ijsselmeer. The bodies of both Air Gunners and the Captain were recovered and buried in Amsterdam. The Navigator’s body was washed ashore on the 4th of July near Harderwijk, where he was buried. Lost without trace age 21 on the 30th of July 1944. Son Of Lyndon And Grace Perry, Of Lower Hutt, Wellington, New Zealand. Sgt. Edmund John Pete, RAFVR 1270404 – Observer. Killed age 20 on the 25th of October 1942. Son of Charles and Rosa Fanny Pete, of Palmer’S Green, Middlesex. Grave location – Joint grave. Sgt. Howard James Hugill, RNZAF NZ414293 – Pilot. Sgt Edmund John Pete, RAFVR 1279494 – Observer. Sgt. Edwin ‘Eddy’ Worsdale, RNZAF NZ412919 – Wireless Operator. Sgt. James George Barnes, RAFVR NZ405362 – Front Gunner. Sgt. L. Newbold, RAFVR – Rear Gunner. Killed age 38 on the 2nd of May 1944. Son of Ernest Gilbert and Florence Margret Pettifer; Husband of Eveleyn Dorothy Pettifer, of West Dulwich, London. ME689 was shot down over France, crashing at St Arnault, 12miles South West of Poix-de-la- Somme. There were no survivors and all seven crew were buried in a collective grave. Lost without trace age 29 on the 5th of February 1943. Son of Frederick and Violet Beatrice Phillips; Husband of Florence Vera Phillips, of Southend-On-Sea, Essex. Grave location – Panel 161. Killed age 28 on the 29th of April 1943. Son of Charles Frederick and Rose Phillips, of Ilford, Essex; Husband of Joan Dorothy Alberta Phillips. Grave location – Grave 26. Eight aircraft were detailed to carry out the above operation with mines of 1500 lbs. One of these aircraft returned early owing to its compass being faulty and four failed to return. The remaining three aircraft successfully dropped their mines in the allotted area and the parachutes were seen to open. A.A. fire co-operating with searchlights was encountered which is believed to have come from an A.A. ship in the mining area. No enemy aircraft were seen. Visibility was fairly good, with scattered cloud in the mining area. Navigation was very good. Stirlings Mk.1 R9290, Sgt. A. Lewis, W.7513 – Sgt. K. Halliburton, BF.467 – P/O D. Thompson, <k.III BK664 – P/O. D.V. Hamer, failed to return. F/S William Phinn, RAFVR 1684789 – Navigator. Killed age 22 on the 14th of March 1945. Son of Peter and Mary Ann Phinn, of Denton Holme, Carlisle. Grave location – 25. D. 2. And those he loved remembered. Sgt. Walter Pickering, RAFVR 1434290 – Flight Engineer. Killed age 28 on the 17th of April 1943. Son of Ellen E. Pierson, and Stepson of Arthur S. Pierson; Husband of Edna Grace Pierson, of Finsbury Park, Middlesex. Grave location – 2. A. 2. F/S James Allan Pirie, RCAF 108000 – Mid Upper Gunner. Killed age 22 on the 30th of May 1943. Son of James Duncan Pirie and Esther Pirie, of Pennant, Saskatchewan, Canada. Grave location – Coll. grave 31. B. 15-17. 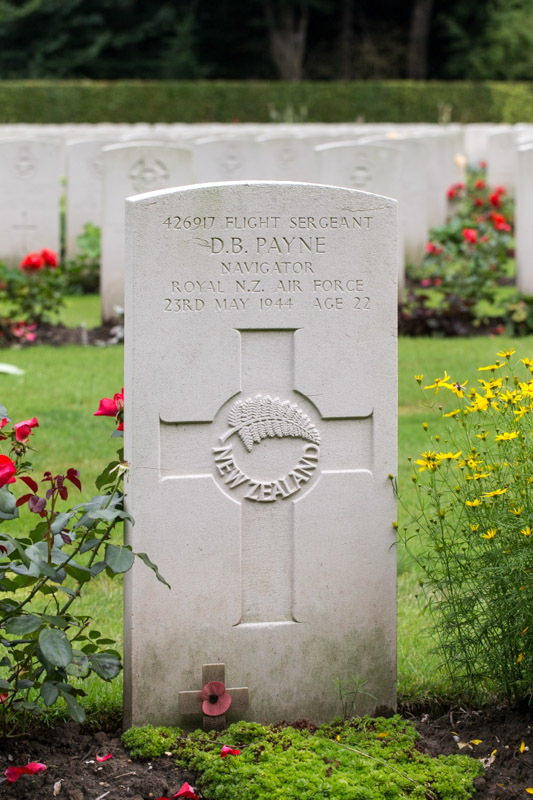 P/O Raymond Frederick Bennett, RNZAF NZ415282 – Pilot. Sgt. Raymond Francis Norman RNZAF NZ416145 – 2nd Pilot. F/S Alan Lloyd Davidson, RNZAF NZ411864 – Navigator. F/S Frederick Alexander Bandy, RAFVR 1318948 – Air Bomber. F/S Stanley Leo Kavanagh, RNZAF NZ403579 – Wireless Operator. Sgt. J.B. Harrison, RAFVR 1052295 – Flight Engineer. Sgt. James Allan Pirie, RCAF R.108000 – Mid Upper Gunner. Sgt. Christopher Patrick Middleton, RNZAF NZ413337 – Rear Gunner. Stirling Mk.III BK776 AA-R was brought down at Odenspiel, 12 miles West North West of Siegen (about 35 miles South East of the target). Only the Flight Engineer, Navigator and Rear Gunner survived but were taken as P.o.W’s. The Captain, P/O Bennett, is now at rest in Rheinberg War Cemetery while the four other deceased were reinterred in the Reichswald Forest War Cemetery. 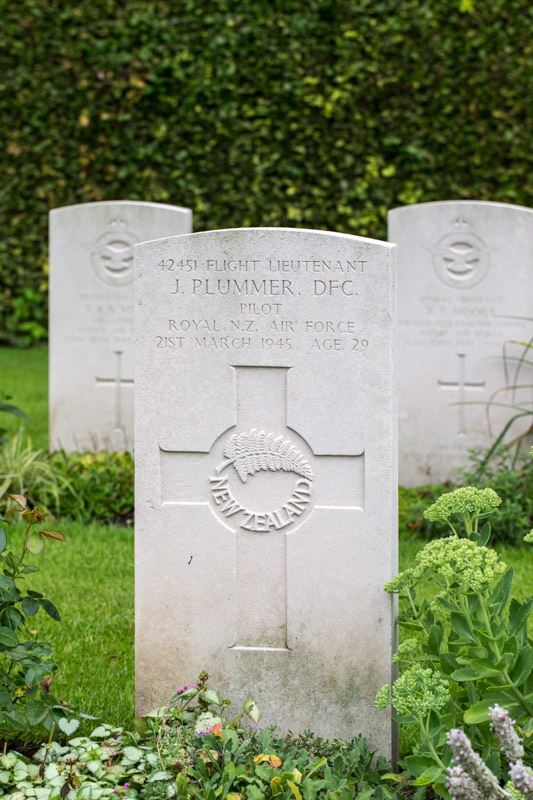 F/L Jack Plummer, DFC, RNZAF NZ42451 – Pilot. Killed age 29 on the 21st of March 1945. Son of Horace Howell Plummer and Ethel Plummer, of Wellington City, New Zealand. Grave location – 12. G. 10. Twenty one aircraft were detailed to attack the Muster Viaduct. There was hardly any cloud over the target. It is thought that the concentration was good although the formation was broken up just prior to bombing. Three aircraft failed to return from this operation – AA”T”, NZ42451 F/L J. Plummer, AA”R” NZ429139 P/O A. Brown and JN”P” 190947 P/O D.S. Barr. All three aircraft were seen to be hit in the target area. Considerable H/F was encountered. P/O Arthur Leonard ‘Tiny’ Humphries, RNZAF NZ428244 – Navigator. P/O Edgar John Holloway, RNZAF NZ429923 – Air Bomber. 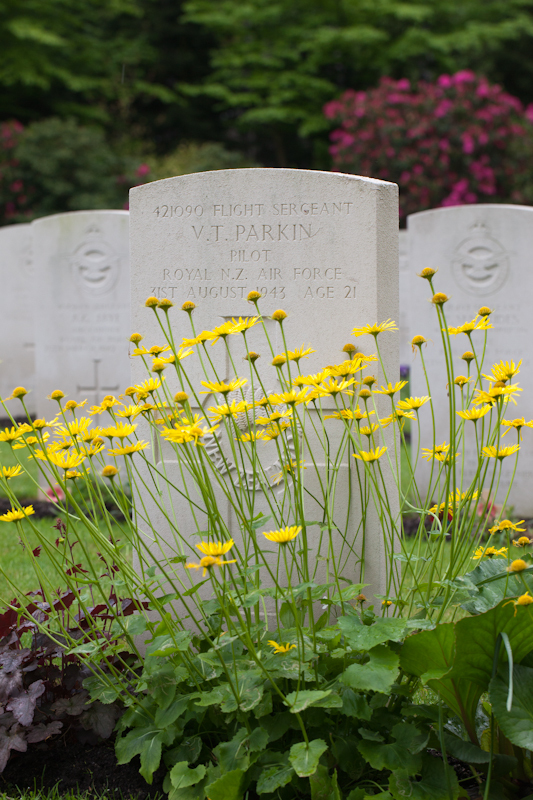 F/O Joseph James ‘Joe’ Wakerley, RAFVR 1325219/169159 – Wireless Operator. Sgt. Maurice O. Fell, RAFVR – Flight Engineer. Lancaster Mk.I NG449 AA-T came under heavy AA fire over the target area and received hits in two engines, then began breaking up. Four of the crew were virtually thrown from the disintegrating aircraft and parachuted to safety, however all were captured as prisoners of war. Both Sgt Fell and F/S McDonald were badly injured. P/O Humphries implored the Germans to arrange medical treatment for them. They were sent to a semi-medical centre where they remained for a short period until the arrival of allied forces. 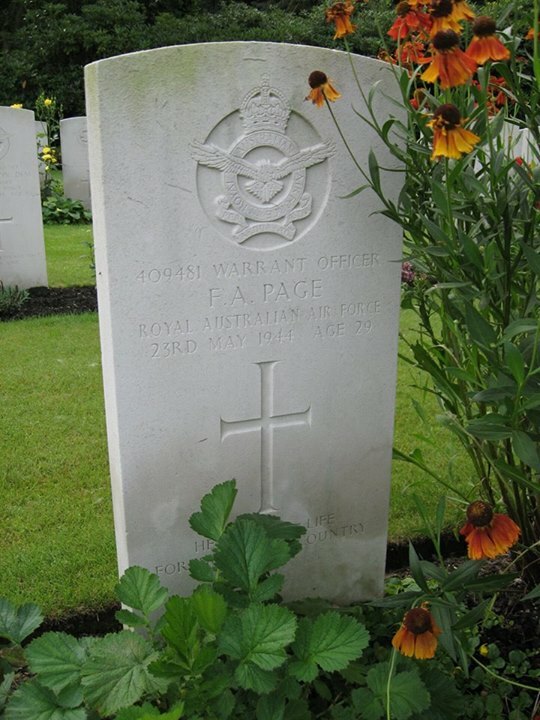 P/O Frank Twain Poole, RAF 42722 – 2nd Pilot. Killed age 24 on the 26th of July 1940. Son of Charles Herbert and Mary Jane Poole, of Invercargill, Southland, New Zealand. Grave location – Plot 69. Row A. Grave 17. Kassel was heavily defended, as confirmed by F/L Adams and other crews who had to undertake violent evasive action to avoid being struck. So it’s possible that Coleman’s aircraft received serious flak damage over the target, but was not totally disabled, allowing the crew to head off westward, with Coleman managing to stay airborne for 320km, almost making it to the coast of Holland. Sgt. Jack Poole, RAFVR 1190686 – Rear Gunner. Son of William and Louie Poole, of Bescot, Walsall. Buried Ryecroft Cemetery, Walsall, Staffordshire, England.. Grave location – Sec. 31. Grave 15. F/S Osric Hartnell White , RNZAF NZ415807 – Pilot. F/S Reginald William Rogerson, RNZAF NZ415787 – Navigator. F/O John Stephen Murray, RNZAF NZ417093 – Air Bomber. Sgt. A.E.G. Smith, RAFVR 1386088 – Wireless Operator. Sgt. Cyril Alan Worledge, RAFVR 573978 – Flight Engineer. Sgt. Timothy James Collins, RAFVR 1583321 – Mid Upper Gunner. Stirling Mk.III EF435 JN-J, F/S White & crew, sustained serious damage. As they approached the target area they were coned by searchlights and then hit repeatedly by AA fire. The port mainplane was holed severely. They continued to the target still coned by searchlights but then came under attack by a Ju 88 night-fighter. The rear fuselage was badly holed by gunfire, which also shattered the rear turret, killing Sgt Poole the gunner. The aircraft then went into an uncontrollable dive and the Captain warned his crew to prepare for an abandonment. At that point the intercom failed and the navigator, air- bomber and wireless operator all baled out believing the pilot was unable to recify the situation. Meanwhile, still in the dive, F/S White jettisoned their bomb load right over the target and succeeded in regaining control of the Stirling at about 6,000ft. After taking stock of the damage, including disabled electrical systems, he decided to attempt the long and hazardous return flight back to base, with only himself, flight engineer and mid-upper gunner on board (and of course the fatally injured rear gunner). They achieved the seemingly impossible task with a skilful crash landing at Mepal at 03.45hrs, without lights, flaps, or undercarriage. F/S O H White was later promoted to Flight Lieutenant, but on 22 Sep 1943 was awarded the Conspicuous Gallantry Medal (CGM) for his outstanding airmanship. Lost without trace age 22 on the 11th of October 1942. Son of Mr. and Mrs. Simion Posner, of Cheetham, Manchester. 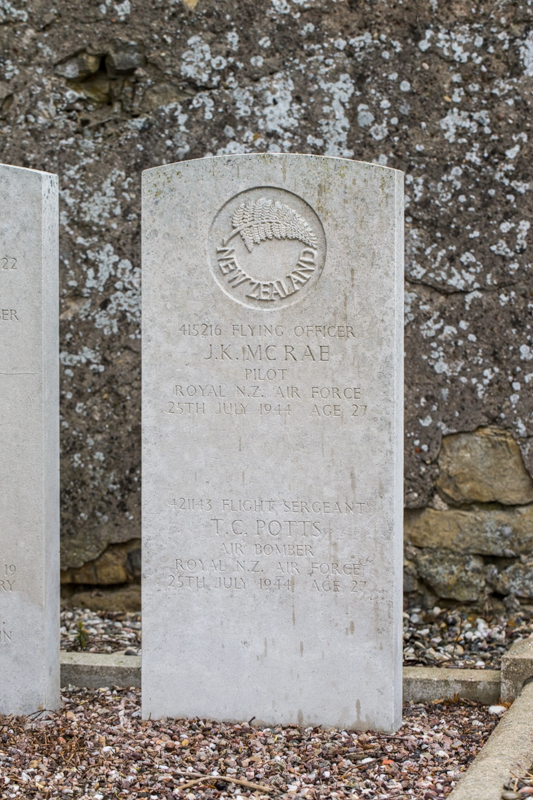 P/O Donald Norman Potts, RNZAF NZ412267 – 2nd Pilot. Lost without trace age 25 on the 9th of July 1942. Son of Norman and Myra Potts, of Opotiki, Auckland, New Zealand. Killed age 27 on the 25th of July 1944. Killed age 33 on the 4th of October 1943. Son of John Thomas Pow and Margaret Pow, of Philadelphia, Co. Durham; Husband of Annie Lilly Pow, of Philadelphia. 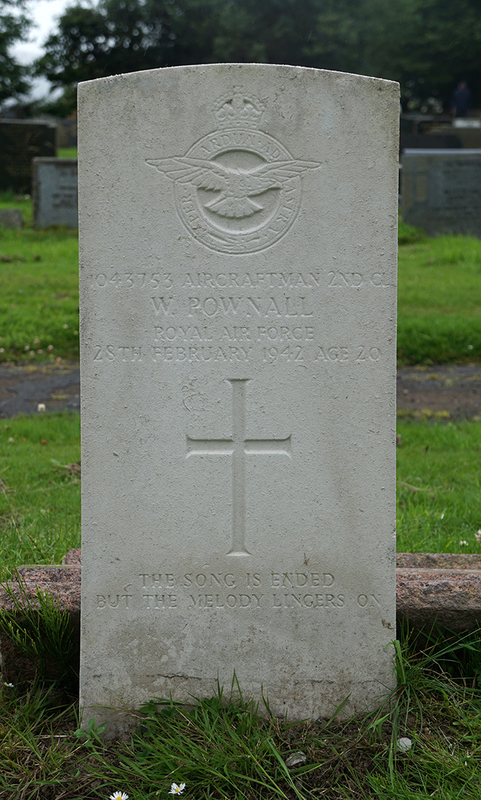 AC2 Wilfred Pownall, RAFVR 1043753 2nd Class 1043753 – Ground staff. Killed age 20 on the 28th of February 1942. Son of Frank and Annie Bowman Pownall, of Glossop. Buried Glossop Cemetery, Derbyshire, England.. Grave location – C. of E. Sec. Grave 5110. Wellington Mk.III X.3355 AA-Y took off from Feltwell at approximately 13:10 on the 28th of February 1942 for an engine check. During the air test the starboard motor failed, followed soon afterward by the port engine. As the crew prepared for an emergency landing, the aircraft stalled and crashed at 4:00pm , near Lime Kiln Farm, Brandon, Suffolk, 5 miles North West of Thetford, Norfolk. The Wellington burst into flames on impact. Army personnel, stationed nearby, along with local inhabitants, helped to pull the airmen from the burning wreckage. The farmer on whose land the bomber had crashed on, a Mr G. F. Harrington was awarded the British Empire Medal, for bravery shown. W/O Robert Edward Preston, RAFVR 1080471 – Mid Upper Gunner . Killed age 22 whilst interred as a Prisoner of War. Buried Berlin 1939-1945 War Cemetery, Germany. Grave location – 1. Z. 15. Five aircraft were detailed to attack the above target with bomb load of 4lb. Incendiaries, but a series of misfortunes left only two to get away successfully. One of these, Stirling I, BK618 captained by Sergeant Scott, failed to return, so the night was an unhappy one. One aircraft failed to take off, one swung so badly on take-off that after two attempts the sortie was abandoned, and the third unsuccessful aircraft returned early with the port outer engine dead, this being due to hitting the top of a drem pole shortly after take-off. The one successful aircraft, Stirling I, R.9243 captained by F/O Trott, dropped its bombs in the target area from 10,000 feet and fires were seen to start. Slight heavy A.A. fire was encountered, some searchlights were also seen operating in cones. No enemy aircraft were seen. The weather was hazy to the target, but clear with good visibility in the target area. Navigation was good, the town being identified by the bend in the river. Sgt. Alexander Scott, RNZAF NZ413484 – Pilot. Sgt. Robert William Sharpe, RAFVR 1496472 – 2nd Pilot. Sgt. Albert Edward Rey, RCAF R.93319/ J.96501 – Observer. Sgt. Walter Keith Wright, RNZAF NZ413310 – Air Bomber. Sgt. 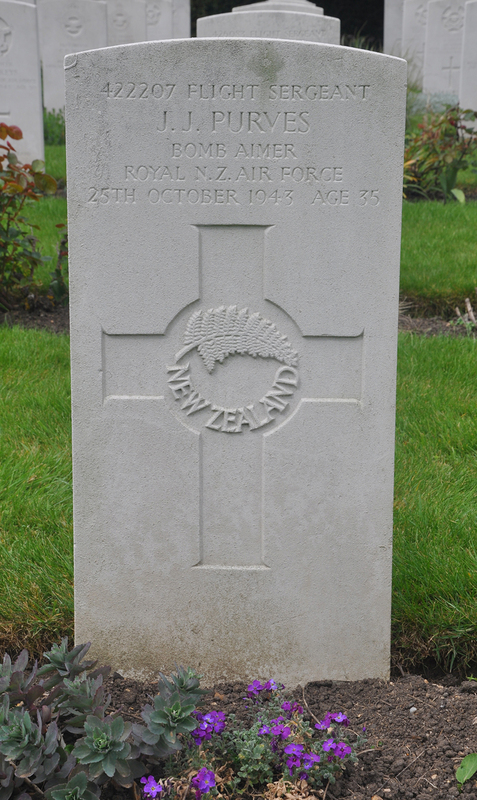 John Robert Smith, RNZAF NZ412907 – Wireless Operator. Sgt. D.C. Baker, RAFVR 574826 – Flight Engineer. Sgt. Robert Edward Preston, RAFVR 1080471 – Mid Upper Gunner. BK.618 was shot down by two enemy night-fighters 10 minutes after bombing the target, Frankfurt. The aircraft crashed in flames at Ida Oberstein, approximately 55 miles South West of the target. Five crew members parachuted to safety and were taken as prisoners. The Pilot and Mid Upper Gunner died in the crash and are buried at Rheinberg, 10 miles south of Wesel. Killed age 24 on the 14th of July 1941. Son of Joseph Edward and Ella Price; Stepson of Mrs. E. M. Price, of West Bromwich. Buried West Bromwich Cemetery, Staffordshire, England.. Grave location – Sec. H. Grave 6090. Eleven Wellington aircraft of were detailed to carry out the above attacks. One of these aircraft, X.9634 captained by SGT Miniken, was climbing on course when, apparently without warning, the starboard engine cut at 6,000 feet. He turned for base but lost height rapidly and force landed near the beach off Corton near Lowestoff. SGT. Miniken and SGT. Gilding (Navigator) were rescued but the others are missing. The weather was poor, there being 10/10 cloud over the target and results were not observed. Severe icing conditions were also experienced. Fairly heavy and accurate A.A. fire was encountered on route and in the target area. Few searchlights in operation. F/S Henry John Price, RNZAF NZ404095 – Wireless Operator. Lost without trace age 25 on the 12th of March 1942. Son of Frederick Charles Price and of Alice Margaret Price (Nee Mattock), of Whangarei, Auckland, New Zealand. Sgt. Henry Welsh Pullar, RNZAF NZ411777 – Rear Gunner. Killed age 25 on the 17th of December 1942. Son of Henry Charles Pullar, and of Ethel Pullar (Nee Welsh), of Otahuti, Southland, New Zealand. Sgt. William Wilson Morton, RAF 621322 – Flight Engineer. Sgt. 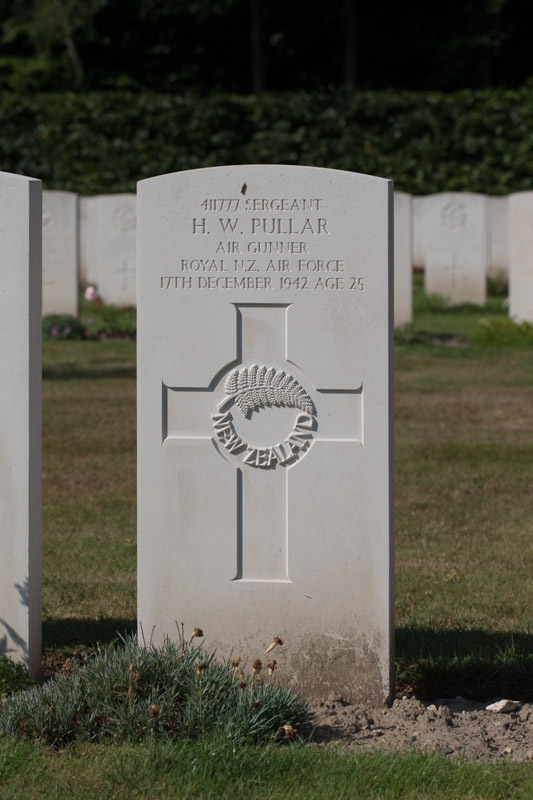 Henry Welsh Pullar , RNZAF NZ411777 – Rear Gunner. Lost without trace age 27 on the 3rd of August 1943. Grave location – Panel 162. Died of Injuries age 35 on the 25th of October 1943. Son of James Purves and of Martha Purves (Nee Davis); Husband of Isabella Margaret Purves, of Orangimea, Auckland, New Zealand. Grave location – Grave 14723.